Fast, Reliable Cutter/Stacker Delivers Time-Saving Convenience. Operator-friendly controls allow for fast ticket setup, operation and error detection. 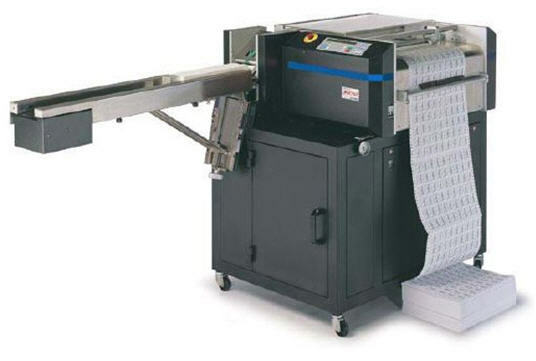 The CS-9018 features automatic top-of-form registration for quick loading of forms. Removable slitter assembly and interchangeable slitter blades enable fast changeover between ticket-size formats. Memory storage of up to 99 ticket configurations also helps to minimize setup time. Adjustable conveyor-speed controls compensate for variations in ticket thickness. And, to increase motor reliability, the CS-9018 has an automatic, pre-configurable time-out circuit to shut down both vacuum and conveyor motors when they’re not in use. The CS-9018 has a double-cut capability that removes the horizontal perforation, delivering clean-cut ticket edges. Separating batches on the CS-9018 is also quick and easy: when printed by Sato laser printers, black separator bars on the header and trailer tickets of each batch enable operators to spot the beginning and end of even the smallest ticket runs at a glance. An attractive enclosed and shelved storage cabinet provides easy access to CS-9018 supplies and provides convenient storage for the optional slitter assembly.